Home › Skin Picking Disorder Treatment Austin › Free Download: Log to track Skin Picking, Trichotillomania, and other Body Focused Repetitive Behaviors (BFRBs). Tracking can be a helpful part of effective treatment for Trichotillomania (Hair Pulling Disorder), Skin Picking Disorder (Dermatillomania, Excoriation Disorder), and other Body Focused Repetitive Behaviors (BFRBs). Here is a log that I created in excel to track your own picking/pulling/chewing. Once you start to use it, feel free to edit it to make it fit your unique needs. Over time you may realize that you predominately use certain columns more than others. You may want to add multiple intervention columns to compare which you tried, not to mention hold yourself accountable for using them! One of the benefits of logging is to improve your awareness of the picking and pulling behaviors. Frequently, people are very surprised when they realize how frequently, or infrequently, they occur. Also, when we have set backs or are in a bad mood for whatever reason, we may believe our picking/pulling is much worse than it actually is. Looking back over time, you may see the progress in the numbers. I have included several key factors that have shown to be significant categories of triggers to picking and pulling. 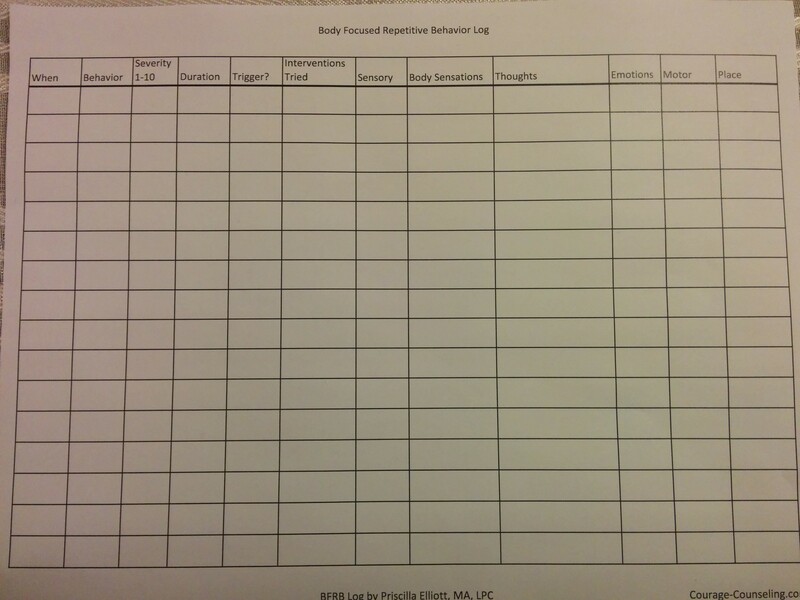 This specific log integrates the domains used in Comprehensive Behavioral Therapy (ComB) and an additional column for body sensations- perfect to use in combination with mind-body therapy or CBT! The idea is to use this information to come up with strategies that meet you unique needs to help you manage and avoid that next pick, pull, or chew. Some people are very emotional pickers, others emotions play very little into it. Some are sensory seeking pullers while others find sensory fidgets useless. The answers may surprise you! It can be helpful to keep track of picking, pulling, and other BFRBs when trying to manage them. 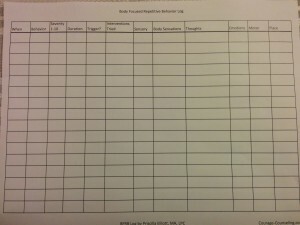 This log keeps track of patterns in the behavior including several triggers and interventions. ‹ What is Comprehensive Behavioral Therapy for Trichotillomania, Skin Picking Disorder, and other Body Focused Repetitive Behaviors?